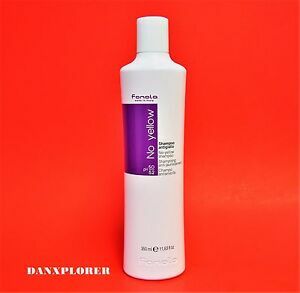 Fanola No Yellow Shampoo 350 ml/ 11.83 fl. oz. danxplorer has no other items for sale. Elynuova Boto Blonde Hair Repair Pro-V Plástica Capilar Keratin Treatment. Committed to keeping E-bay as an honest place for business and fun! serious bidders only! Only authentic items! Great, fast shipping. Perfect fit.👍 thank you. Came quickly & at a very reasonable price. Everything perfect. Very fast delivery. I was a bit weary of the price tag, but my stylist rec'd it to keep my blonde hair toned icey blonde and to keep the yellow away even though she doesn't sell it, so I thought it was worth a try. It looks more like ink than shampoo and it will stain your hands a little if you don't wash them, so be careful of that, but WOW. This stuff really works. I'm very bad at doing hair and using hair products and I only wash my hair myself a few times a month so I'm really no expert at application but wow did this evenly tone my hair to a silvery white blonde. Awesome product and will re purchase in the future. This shampoo does the trick. My hair just loves to grab brassy color and it has always been the absolute bane of my existence. Until now. It worked the first time although I only left it on for two minutes (directions say to leave it on between 1 and 5 minutes). Not perfect results the first time but still ah-mazing. I left the shampoo on for 5 minutes the second time and that was my sweet spot (your sweet spot may be different, experiment!). Gorgeous brass free locks. People actually asked me if I had just had my hair coloured because it looked so bright. I will keep buying this because, quite simply, it works and is not expensive. For my collarbone length hair, I used somewhere between a quarter and half-dollar size dollop. Blondes never looked better. This purple shampoo took the warm/orangey tone out of my blonde in one five minute use. Smells like blueberries!! Only con is it can stain your hands purple/blue and your hair if you don’t rinse it out thoroughly. Totally love this shampoo. Pics show before and after of first use, and single pic of me shows how light my hair actually looked after second use.